Geometric tiles in classic shapes, such as chevron, hexagon, stripes, honeycomb or octagon, are a great way to add style to your home's wall or floors. More intricate patterns reproduced on a single tile will always be more expensive than plain tiles. Here are a few tips to create style and accommodate just about any budget. Tip #1. Create a pattern using plain or solid-color tiles using different standard formats. It's easy to create bold and unique patterns by mixing and matching less expensive plain or solid color tiles that would be less exciting on their own. Consider using field tiles from our Malibu and Yucatan lines. There are hundreds of glazes and the high-fired tiles can be used on walls and floors, inside and out - even in areas subjects to hard freeze thaws. Grit can also be added if slip resistance is a concern for commercial and wet areas. Tip #2. Make a mosaic. You can create a mosaic-like effect with cement tile using simple patterns like our Traditional Geo #3 shown here. The Geo 3 cement tile pattern creates a mosaic tile effect at a fraction of the cost. For an accent strip in your bath or kitchen, consider our Fragments line of easy-to-install, face-tape mounted mosaics. Fragments are colorful mosaic accent strips made from patterned cement tile. Available in four colorways - spring, summer, fall and winter - and in three formats (Small Squares, Large Squares, and Bar). We use a standard grout thickness of 3-4 mm on all formats. Thankfully, cement tile comes in a myriad of sizes and shapes, so it's not difficult to create a simple checkerboard in classic black and white, or any two tones you like. Cement tiles are also available in many more shapes than just square and rectangular formats. You can find hexagonal formats, colonial paver and arabesque formats, too. Tip #3. Blend glazes or colors using tiles of the same shape. Create a more complex and rich look by blending three or four colors. For a more organic look, blend the colors randomly. For a bold, contemporary design, you can run the colors in stripes or rows. A great example of creating a blend can be seen below with our Clay Arabesque Leon pattern, which uses three colors from our Malibu Ceramic Field Tile collection: Sea Foam Matte (#5503u), Mushroom Matte (7504u), and Winter Grey (#405c). Clay Arabesque tiles in three glazes provide a rich look and are perfect for a backsplash. A more contemporary look can be created using any Rustic Paver and Tile in a square or rectangular format in using the Metro Blend. The soft neutral colors and earth tones in this blend are easy to work with. Shown here in a 3"-square format, the blend consists of equal parts Charley Brown, Natural Gray, and Charcoal. Tip #4. Add texture to the color blend for a vintage look and lots of variation in color. Take it a notch further with our Rustic Pavers and Arabesque cement tiles by adding texture to the color blend. I love the look of these 6" Arabesque Hexagon tiles in Normandy Cream. This vintage look is created by blending both color and texture in these hand-crafted cement tiles. This classy color combination is created using equal parts Cotto Gold, Cotto Dark, Cafe, and Tuscan Mustard. Pieces are then finished with standard (smooth), Limestone, Travertine or Luna texture. It's important to remember that the most cost-effective tips will be to use standard tile formats, existing colors and glazes without texture. Avente has the resources, experience and skill to make your dream a reality. Contact us via email with your project timing, budget and design requirements. We will schedule a time to discuss options that meets your goals and budget. Contact Us with your project details. We'll schedule a time to discuss options! As we conclude our tour of the Original Los Angeles Spec House, I'll pick up where we left off from last week's post. First, a little background information! If you love tile, then you can't miss this rare opportunity to tour a house with tiles installed in nearly every room, including some Royal Delft cloisonné decorative tiles. Located in the Fairfax District of Los Angeles, the home tour was arranged by Joe Taylor and Sheila Menzies of The Tile Heritage Foundation for a collector. As we finished walking through the kitchen area, we traced our way back from the utility room off the kitchen to the living room. That's when we spied a glazed mural in the kitchen that I had previously missed. A Dutch-themed mural in the kitchen dates back to the 1920s. The glazed murals in this home are just amazing! Each mural looks like an oil painting, with the tile-maker's skills and understanding of glazes nothing short of exceptional. Falling behind the group, I caught up with them in the main bath, where there were two large murals. The one above the bath was inspired by Maxwell Parish and the other, in the shower, was of Yosemite Falls. Yosemite Falls is the subject of this hand-painted mural from the 1920s. A playful Maxwell Parish inspired theme is found on the mural above the tub. Royal Delft cloisonné decorative tile accent: swan. Royal Delft cloisonné decorative tile accent: Columbus' Ships. As you step back from the walls, you can't help but notice the quaint floor tile pattern created with plain tiles. Finally, a peek at the small private bath off the main bedroom - as was the custom in houses of that era. The rich, cobalt blue field tile framed the bath beautifully, while the use of stained glass provided ample light and privacy in this small 1-3/4 bath. Playful water nymphs were the subject of the mural for this bathroom's hand-painted tile mural in the shower. Fretwork trim frame rich cobalt blue tile in this bathroom. Playful water nymphs are the theme for this mural. Can you believe all of these tiles are in one home? I want to thank the Tile Heritage Foundation for making this possible. A special thank you to the home owner who so graciously opened his home for all of us to see. This is truly a gem and I'm so thrilled that the tiles have been preserved in their original condition. What a wonderful treat it was. Thank you all, again! Recently, I had a rare opportunity to tour a house with tiles installed in almost every room including some stunning tile murals and Royal Delft decorative tiles. Located in the Fairfax District of Los Angeles, the home tour was arranged by Joe Taylor and Sheila Menzies of The Tile Heritage Foundation for a collector. The small, unassuming corner lot house is a treasure trove of original Dutch cloisonné tiles and mural from the 1920s. As soon as you pass the entry gate, you know this is no ordinary home. You are immediately greeted by an Art Deco fountain in the courtyard. Created entirely of tile on a concrete base, every detail is tiled including the spitting-fish fountain heads and intricate bead-work molding and trim. Spitting-fish fountain tiles and exquisite beaded trim tiles are part of the Art Deco-tiled fountain design. Open the mahogany door and dappled light spills onto this glazed tile mural in the entry. The mural exhibits rare craftsmanship because the glazing appears to have the same detail of a hand-painted oil painting. Tile mural in the foyer of the 1927 Los Angeles spec house. Our host, and owner of the home, Robert Smaith, explains the home was originally the spec home for all the homes built in the area. It's where home owners would go to select tiles and other finishing details for their home. Once you enter the home, you can't help but notice the beautiful tiled fireplace. Tile fireplace with Royal Delft cloisonné accents. Hound and Stag cloisonné tile is the focal point of the fireplace. Dutch cloisonné tile is enveloped with trim and field tile. Joe Taylor, whose encyclopedic knowledge of tile and tile history is impressive, explains that Royal Dutch cloisonné tiles were only made by one factory in The Netherlands. The process, which uses a mold to keep the glaze colors from mixing, is not all that different than how cement tiles are made. Of course, cloisonné tiles must be fired; but, the mold forms the patterns and maintains the colors in the decorative tiles you see. Moving along to the sunny south-facing breakfast nook, I was amazed by the small format mosaic on the floor and the stunning murals of Montserrat. According to our host, the owner's of the tile factory had a home on the Caribbean island. Breakfast nook mosaic floor and tile walls include a mural. One of two murals in the breakfast nook featuring a landscape of Montserrat. The floor-to-ceiling tiled kitchen includes some amazing tile work that I have never seen before, including a tiled pantry, bread-making pull-out, and a California cooler. The kitchen includes floor-to-ceiling tile. A tile pantry with pull-out bread-making counter. A tiled mural from a Dutch painting graces the area above the sink in the laundry room. Next week, I'll finish this fantastic tour with a glimpse of the master and guest bathrooms, more Royal Delft cloisonné tile, and a tiled telephone niche. If you love historic tiles, then this is a rare chance to see some of the most well-preserved tile trends from 1920s vintage Los Angeles. Our new Geometrical Glazed Ceramic tile collection was used to create this appealing kitchen backsplash. Our Geometrical line of ceramic tile mixes classic hand-painted glaze techniques with modern, geometric patterns to achieve an absolutely stunning look. They are ideal for backsplashes, accent strips or anywhere a splash of design is needed. The Geometrical Ceramic Tile collection features hand-glazed, modern patterns. Hand-painted in the USA using the traditional Cuerda Seca (dry cord) technique, this latest addition to our ceramic tile collection is available in 6-, 5-, 4-, and 3-inch square formats, with each pattern offered in at least four colorways. Suitable for indoor or outdoor use, these high-fired ceramic tiles are suitable for indoor or outdoor use. Because they are hand-painted, variations in glaze colors, aswell as a slight relief from pooled glazes, should be expected. Adding to their versatility is the fact that the Geometrical ceramic tile collection can be used in submerged/wet applications (such as pools, ponds and fountains) by applying a clear overglaze. For floor applications, grit can be added to the glaze to reduce slippage. Moreover, the Geometrical tile pattern glazes coincide with our Malibu Field Tile palette. With this added flexibility in design, the patterns and colors within the Geometrical deco line perfectly complement the 50+ glaze colors available from our Malibu Field Tile collection. To make things even easier, the glaze colors used on the Geometrical collection are individually identified on the Avente Tile site. A sampling of the ceramic glaze colors available with our Malibu Field tiles. Also of note is that the solid-colored, high-fired Malibu Field tiles are created using classic red bisque. Available in 3"x3", 6"x6", 4"x4", 4"x5", 6"x6" and 4" Hexagon sizes, as well as a full line of trim and molding, these tiles are made-to-order so please allow four weeks for delivery. Geometrical shapes have made a comeback in the design world. 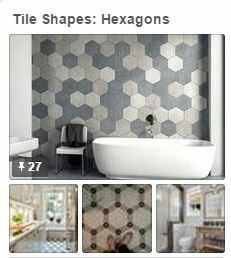 Everything from wallpaper to fashion accessories, and of course tile, are now proudly touting the angular allure of hexagons, octagons, and more. Thankfully, our tiles have always been in vogue, despite changing trends. In addition to the Geometric Cement tiles and Arabesque Cement tiles we offer, our new Geometric Ceramic tiles will continue to add to the centuries-old appeal of handmade and hand-painted tiles in any design environment. 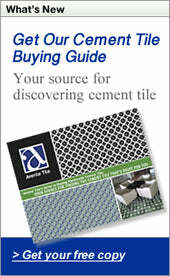 Looking for cement tile? Need it now? Take a look at what's in-stock and ready to ship NOW! These in-stock patterns move fast, so don't delay! Place your order today.